Network Solutions is more than just a vendor. We strive to maintain a highly certified and experienced staff of specialists. Our engineers are what make Network Solutions one of the leading IT providers in the Midwest. We have experts with experience in every product we sell because we place the utmost value in making sure our staff is able to be the best at what they do. Cisco Certified Internetwork Expert Data Center (CCIE Data Center) certifies the expert-level skills required for the planning, design, implementation and management of complex, modern IT data center infrastructure. Professionals who achieve CCIE Data Center certification have demonstrated their technical skills at the highest level using industry best-practices. 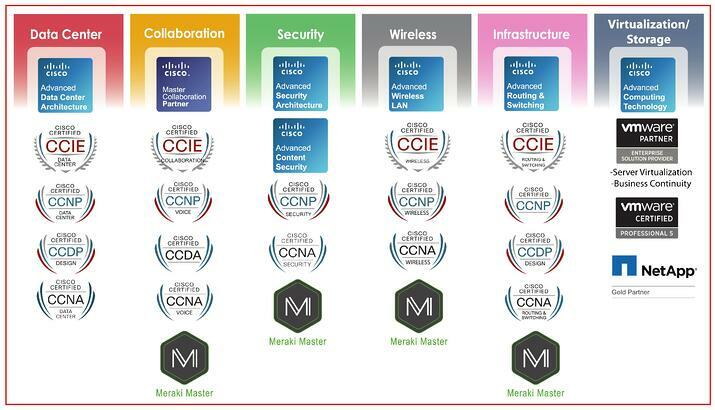 The Cisco Certified Internetwork Expert Wireless (CCIE Wireless) certification assesses and validates wireless expertise. Candidates who pass the CCIE Wireless certification exams demonstrate broad knowledge of wireless networking and a solid understanding of wireless local area networking (WLAN) technologies from Cisco, the market leader in WLAN technology. The CCIE Collaboration certification is an expert-level certification that ensures knowledge and experience in collaboration solutions integration and interoperation, configuration, and troubleshooting in complex networks and the challenges of video, mobility, and presence as the foundation for workplace collaboration solutions. Earning the Advanced Security Architecture Specialization exhibits a higher level of technical expertise and understanding providing customers more advanced solutions for their business needs—whether they’re small businesses, large enterprises, or anything in between.